FULL SERVICE Let us know how we can be of help. You can count on a studio staffer nearby to answer questions and facilitate EQ. Modify your light in a big way. Our height gives you more possibilities for setups and shooting. 19’ wide x 16’ high. 22' long + additional 15' wood floor shooting space. 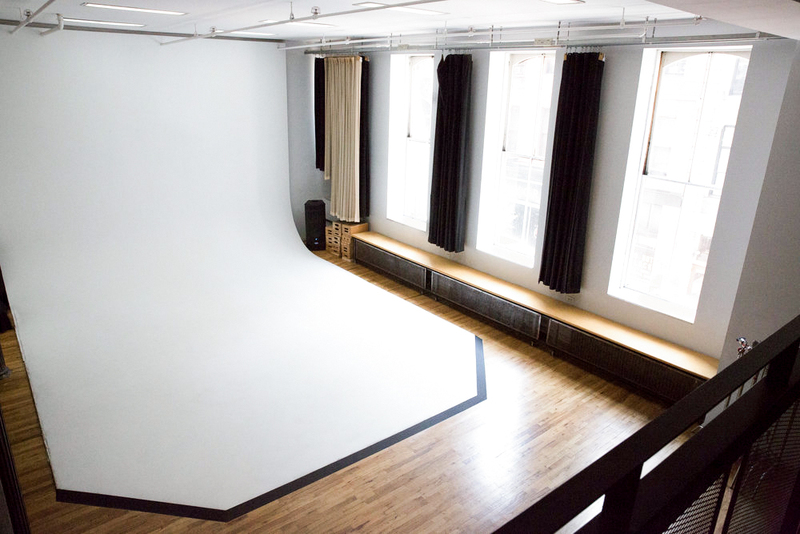 Use the upper-level space as a separate area for a clothing stylist, client lounge or an additional set. Privacy curtains already installed. A wall of oversized southern-facing 11’ windows greets you as you enter the shooting area. Full blackout and linen curtains control the natural light. Bench seating underneath. Electric: 100 amps, 5-wire, 3-phase. Equipment rental. Freight elevator. Fast WiFi lets you access our sound system wirelessly. Your private studio for the day. Two makeup stations on wheels. Open prep kitchen with complimentary coffee. Wheelchair-accessible in-studio bathroom. Secure WiFi. Your pet is welcome to come and supervise!